Quote statuses follow the lifecycle of a quote from draft to approved and allow you to keep track of where each of your quotes are in their lifecycle. Each of the statuses listed below are automatically set for you when specific activity occurs with a quote but you may also choose to manually change the status at any time during the quote lifecycle. When a quote is first created, it is placed in Draft status by default. Sending a quote by email will automatically change the status from Draft to Sent. Clients cannot view any quotes when they are in Draft status. 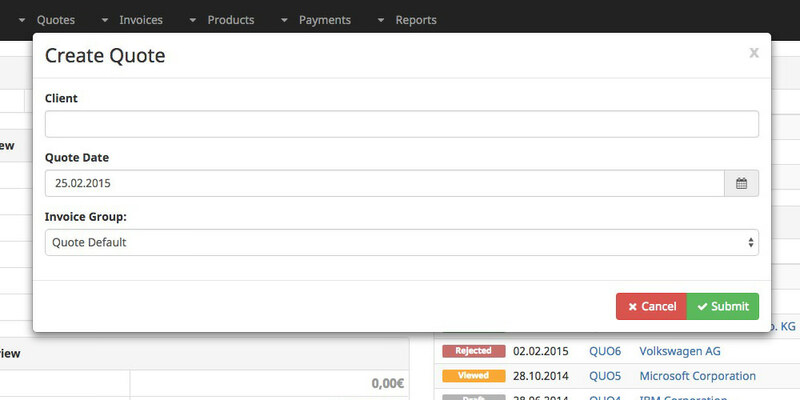 When InvoicePlane sends a quote to a client by email the status will be changed to Sent. When a client views the quote by either using the Guest URL to view quote or by using their Guest Login account (if they have one), the quote will be placed in Viewed status. This allows you to keep track of which quotes a client has looked at. When a client uses the guest URL to view a quote or logs in using a guest account and views a quote, they are able to either approve or reject the quote. When a client approves a quote, the status is changed to Approved. When a client uses the guest URL to view a quote or logs in using a guest account and views a quote, they are able to either approve or reject the quote. When a client rejects a quote, the status is changed to Rejected. This status can be used for quotes that are not going to make it to the invoicing stage but need to be kept for reference purposes. Clients are not able to see quotes in this status. To view the quote list, click Quotes from the main menu and select View Quotes. By default, the quote list will be filtered to all quotes. The filter can be set to All, Draft, Sent, Viewed, Approved, Rejected or Canceled by choosing the filter from the submenu bar. To create a new quote, either choose Quotes from the main menu and select Create Quote, or from the quote list, click the New button near the top right of the page. When creating a quote, start typing the name of the client to create the quote for. If it's an existing client, choose their name from the list that appears. If it's a new client, type their full name or business name. Choose the date and invoice group and submit the form. To add saved products, press the Add Product button. Choose the product you want to add and mark the checkbox on the left, then press Submit to insert the products into the quote. 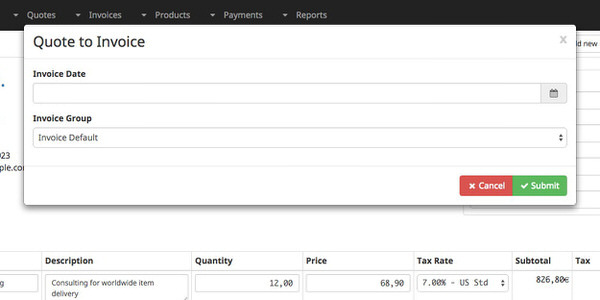 You can edit the quantity, prices or taxes for each product. When finished, press the Save button. 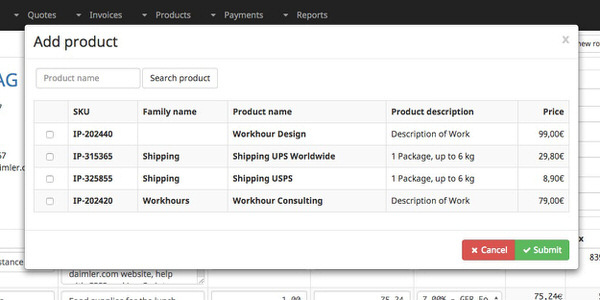 The order in which an item appears on a quote or invoice can be changed by dragging the row to a new position with the icon. Item discounts can be added for each item itself as an amount that will be subtract from the item subtotal. Item discounts can only be added as an amount, not as an percentage. Quote discounts can be added for the whole quote directly above the quote total. You can either choose to add a discount as an amount (e.g. 200 $) or as a percentage of the subtotal (e.g. 5%). To apply a tax against the entire quote, choose Add Quote Tax from the Options button. Choose the appropriate tax rate and placement from the window that appears and press the Submit button. That tax will be calculated against the quote total. Caution! Do not mix item and quote taxes. Both tax methods were implemented for countries with different law structures and do not work together very well. If you use both tax method at the same time we can't promise that all calculations are executed correctly. Also, do not use item taxes to apply any service charges or similar extra charges. If you need to apply charges, add a new item or calculate the charges manually. To copy a quote, choose Copy Quote from the Options button on the edit quote page. 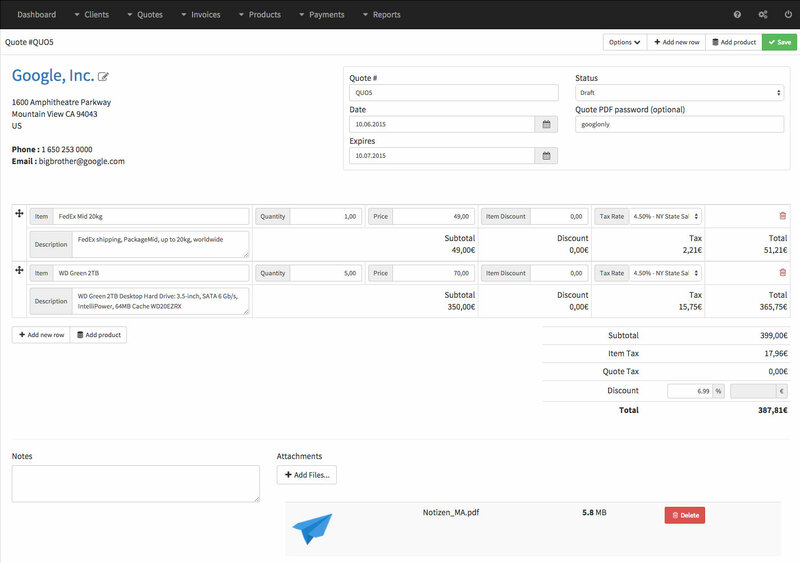 Change the client name, if appropriate, and then select the quote date and quote group and submit the form. 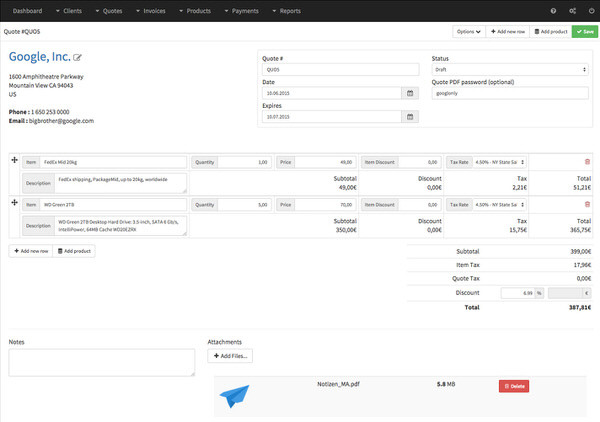 All items, taxes and amounts from the source quote will be copied to a new quote. When a client accepts a quote, you can convert that quote to an invoice by using the Quote to Invoice menu item from the Options button. Choose the invoice date and invoice group and press the Submit button. The items from the quote will be copied over to your new invoice.